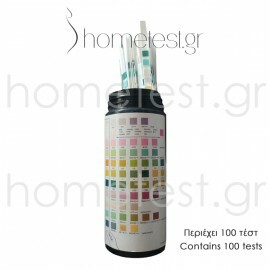 HomeTest urine analysis test - 11 parameters. 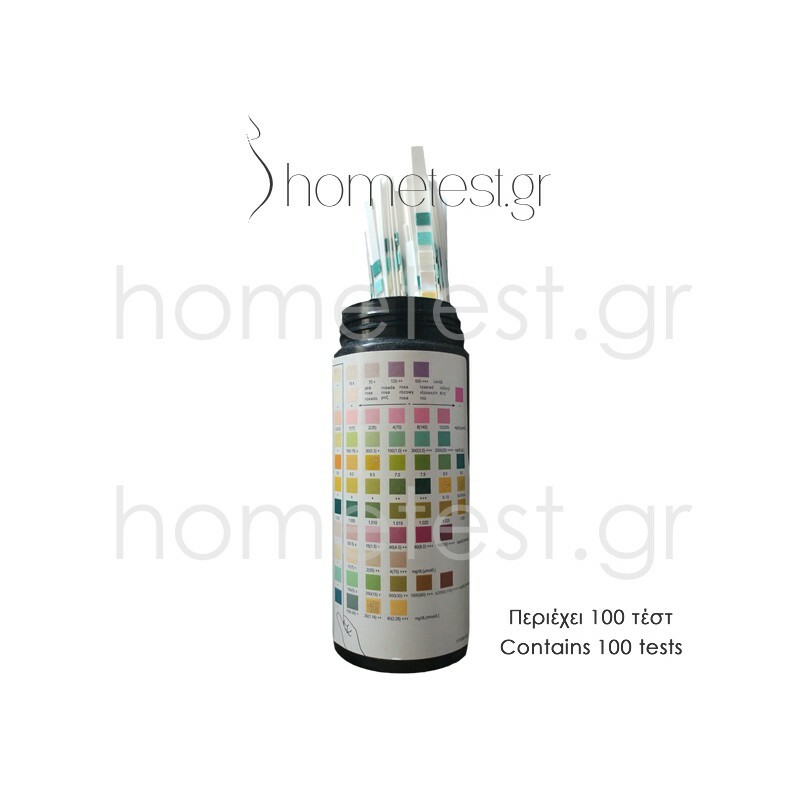 HomeTest urine analysis strips provide a quick and reliable diagnosis. Detect possible urinary tract infection, diabetes or kidney disease. They are suitable for the whole family and especially for women in pregnancy. Cost per test: 0.05 €. 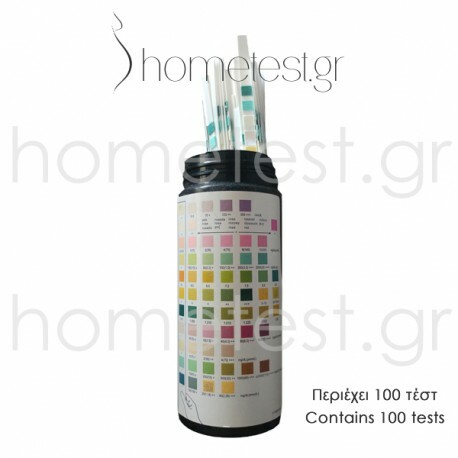 The HomeTest urine analysis test- 11 parameters, detects any urinary tract infection, diabetes or kidney disease. The results are directly visible by comparing the color on the tests and the printed colors on the label of the package. You do not need any other special equipment to perform the test. In the enclosed instructions you will find the analysis of each color change of the test. Any pathological value should be transferred to your doctor for further consideration. No need for a sterile urine collector for the tests to work. A simple plastic cup is enough. The Urinalysis Reagent Strips (Urine) may be affected by substances that cause abnormal urine color such as drugs containing azo dyes (e.g. Pyridium, Azo Gantrisin, Azo Gantanol), nitrofurantoin (Microdantin, Furadantin), and riboflavin. The color development on the test pad may be masked or a color reaction may be produced that could be interpreted as false results. Ascorbic acid: No interference is known. Glucose: The reagent area does not react with lactose, galactose, fructose or other metabolic substances, nor with reducing metabolites of drugs (e.g. salicylates and nalidixic acid). Sensitivity may be decreased in specimens with high specific gravity (> 1.025) and with ascorbic acid concentrations of ≥ 25 mg/dL. High ketone levels ≥ 100 mg/dL may cause false negative results for specimens containing a small amount of glucose (50-100 mg/dL). Bilirubin: Bilirubin is absent in normal urine, so any positive result, including a trace positive, indicates an underlying pathological condition and requires further investigation. Reactions may occur with urine containing large doses of chlorpromazine or rifampin that might be mistaken for positive bilirubin. The presence of bilirubin-derived bile pigments may mask the bilirubin reaction. This phenomenon is characterized by color development on the test patch that does not correlate with the colors on the color chart. Large concentrations of ascorbic acid may decrease sensitivity. Urine measuring tests are disposable. The tests must remain in their case until the time of use. Protect them from moisture and direct sunlight. Do not touch the color parts of the test with your hands. Discard any test that has been damaged or discolored. Discard the used test after reading the results.